The word ‘catchphrase’ first appears in print around 1850 (according to the OED), and so the birth of the phenomenon of the catchphrase (at least as a labelled and understood term) coincides somewhat with Charles Dickens’s own career as a writer. One of the biggest catchphrases of the 1830s and 1840s, when Dickens was starting out as a novelist, was the following enigmatic Cockneyism: ‘Has your mother sold her mangle?’ Curiously, this phrase is first recorded in print by none other than Dickens, in his Sketches by Boz (again, this is recorded in the OED). The history of the catchphrase is therefore bound up in curious ways with Dickens’s own career. And what’s more, we can see the importance of catchphrases, and all that they embody, right from the start of Dickens’s novel-writing career, with his first novel, The Pickwick Papers. Pickwick was very nearly a failure. We’re used to thinking of Dickens as the most beloved novelist Britain has ever produced, so it’s easy to forget that in the early stages of his career, he very nearly blew his big chance to become a successful writer. The character who saved Dickens’s career, just when it looked as though it was going to suffer a catastrophic false start, was a man named Sam Weller. Dickens had started serialising his first novel, The Pickwick Papers, but readers had grown bored with it and sales had started to decline. Then Dickens conceived the character Sam Weller, who would act as comic foil and sidekick to the main character, Samuel Pickwick, and almost overnight the novel was saved. Sam Weller reversed the fortunes of the novel, until within a few years of the novel’s publications, there were parodies of it, and stage adaptations, and the rather corpulent title character even gave his name to obesity hypoventilation syndrome, where overweight people struggle to breathe properly (this was initially named ‘Pickwickian syndrome’ in honour of Dickens’s character). What an honour! Sam Weller’s phrases and stories came out of nineteenth-century entertainment, and so in one sense, so did Dickens’s career. The phrases of Sam Weller – the first in a long list of classic comic creations Dickens would release to the world – were heavily influenced by a musical farce from Dickens’s childhood which featured a character with the name of Simon Spatterdash. 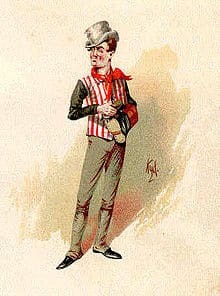 The comic actor who played this character on stage was Samuel Vale, and his comic catchphrases became known as ‘Sam Valerisms’ in honour of him. (From Samuel Vale to Sam Weller seems a short step for Dickens to have made.) Sam Weller’s phrases echo Sam Vale’s in their formulation and structure. They are not catchphrases in the strictest sense – in so far as they are different each time – but they do always follow a set formula, namely the utterance of a cliché, followed by ‘as [so-and-so] said when [such-and-such happened].’ An example from the novel is: ‘out vith it, as the father said to the child, ven he swallowed a farden [farthing]’. Characters like Sam Weller are important to Dickens’s art, and arguably not just because they provide us with a laugh: they seem to exist solely for comic effect and yet they also manage to hint at some of the weightier themes and ideas of his work. Sam Weller also demonstrates how, from early on in his career, Dickens had learned – and learned the hard way – just how important and valuable the use of comic characters alongside the principal protagonists in his novels could be. Indeed, it is these so-called ‘minor’ comic characters who had been the making of him. He knew that they were what his readers wanted – entertainment – but he also saw that he could also use them as a vehicle for the issues he wished to explore. They were useful for an author who was writing for serial publication, too – they helped to keep the novel’s characters firmly in their readers’ minds until the next monthly instalment came along. Catchphrases saved Dickens’s career; but they are also arguably at the centre of any discussion of his comic genius. To coin a phrase. More interesting facts about Charles Dickens here.